Home » Compost Tea, what is it and what can it do for your bowling green? Compost Tea, what is it and what can it do for your bowling green? Compost Tea is a home made spray that is applied to fine turf to increase the micro life in the soil. We know that healthy turf is an essential element of a performance bowling green. We know that in order to maintain turf health we must have healthy, vibrant soil. As a regular visitor to bowls central you know that I’ve (almost) exhaustively ranted on about soil microbes and how important they for the health of the soil and turf. The fact is that many of our greens are maintained in an unsustainable manner, both agronomically and economically. Over the last 4 decades, greenkeeping has slipped into a negative space with practices that focus only on symptoms management. The over reliance on inorganic fertilisers and pesticides and the obsession with sand top-dressing has reduced many greens to unpredictable, annual meadow grass dominated swards that are difficult to maintain for performance, which of course is what our members want from the green. On such greens, much of the greenkeeper’s time is spent fire-fighting; watching for disease outbreaks and spraying them, adding ever increasing amounts of inorganic fertiliser to try to produce a surface for big games, top-dressing to try to overcome the surface anomalies that are constantly changing and moving due to excessive thatch. Now, with the available pesticides being diminished rapidly and with many legal restrictions on who can use them anyway we are fast approaching a time when bowling clubs and golf clubs can no longer afford to continue on this road. A road that, incidentally, forces greenkeepers to constantly fight against nature instead of working with it. But there is an alternative future that is much brighter. Natural greenkeeping methods are becoming very popular again at last. My book Performance Bowling Greens, which promotes this kind of approach to green maintenance has increased in popularity every year since it was first published in 2010. One management practice that I didn’t cover in any detail in the book (but which will definitely be featured heavily in the next edition) is the use of Compost Tea as a key part of any greenkeeping program where the soil and turf has been compromised by years of inorganic fertiliser and pesticide use. Now, given the right conditions these soil microbes replicate and grow in number very rapidly and this is the reason for the tea brewing process, to make a spray solution that is abundant in beneficial soil microbes. To encourage this rapid upscaling in the microbe population we add a food source for them to the tea brewer. This can be formulated to encourage a bacteria dominated tea for annuals such as Annual Meadow Grass (Poa annua), or a fungi dominated tea for perennials like bentgrasses (Agrostis) and fescues (Festuca). More on the reasons for that in a later article. 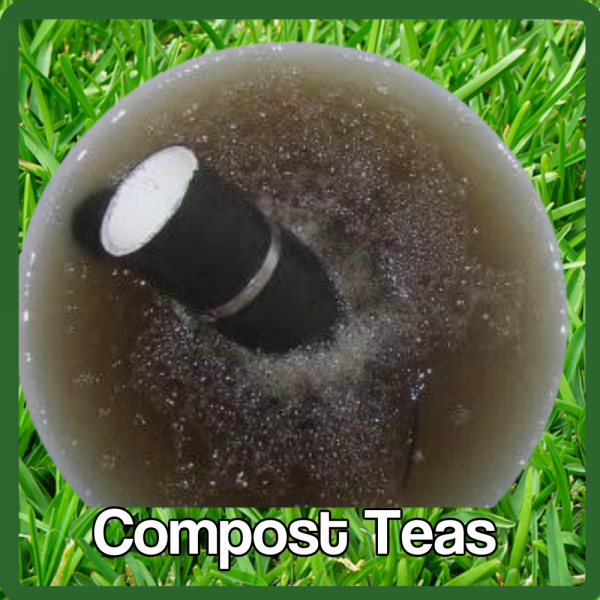 In the case of compost tea, brewing describes the constant oxygenation and agitation of the tea mix by means of a special pump. The added oxygen and food source ensures that the microbe population explodes and multiplies many times over. When the brew is ready it is filtered into the sprayer, diluted and then applied to the turf directly. On greens that have been managed in the conventional way for any length of time i.e. using pesticides and inorganic fertilisers, it’s likely that the soil microbe population will be significantly depleted. There might also be gaps in the eco-system, essentially “missing microbes”. Compost Tea provides a fresh population of the full range of microbes to bolster existing populations and even re-establish missing ones. Through repeated applications of your Compost Tea these new microbes will establish and replicate. The benefits of this full and abundant population of soil microbes will be manifold as their specific enzymes and toxins act in the soil encourage plant health for the very species you want to promote. Even in relatively healthy greens, where thatch is under control and a more natural greenkeeping program is already used, Compost Tea provides a wonderful probiotic boost, maintaining microbe diversity and helping to compensate for microbes lost through predation (it’s a jungle under your feet!). By maintaining a diverse population of soil microbes you can make sure that the soil eco-system remains in balance and that no single organism dominates or is allowed to grow uninhibited. Think about that for a moment. The soil most likely to encourage the perennial grasses we are trying to encourage is one where there is a strong population of the full diversity of soil fungi. If one of these fungi, let’s say fusarium, becomes dominant then we get disease outbreaks if all of the other conditions are right for that. So by spraying fungicides (which kill all fungi, good and bad) regularly, we are almost guaranteeing that we will have a sward dominated by soft, shallow rooting, seed-head producing annual meadow grass! But why do we need Microbes? Like I said earlier, the soil is like a jungle with many billions of organisms shouldering their way through the crowd to claim there spot in the eco-system. It’s very uncivilised down there, almost anarchic and certainly has a dog eat dog quality to it. We humans definitely have the best role in this particular eco-system, gently rolling up the odd wood and sipping real ale in the sun. Meantime our essential microbes are engaged in all out warfare. producing chemical toxins with which to stop and kill each other. This keeps the overall population in the right order. Left to their own devices this activity ensures that no single species can dominate and become a problem to our grass plants or the other microorganisms. Some microbes are predators and some are prey and this also has the effect of keeping things in balance. Squabbling aside, these microbes all have important day jobs. They produce a mind-boggling array of enzymes which breakdown organic material like thatch, making the soil crumbly and providing it with structure. This recycling of organic material, helpfully results in the microbes excreting by-products of their activity like Nitrogen in the form of Ammonium, useful! The soil Nitrogen cycle is carried out primarily by specialised Bacteria in the soil. During this miraculous process, Nitrogen in the form of Ammonium and Nitrate are fairly useful by-products. Other specialised microbes in make Sulphur soluble, producing sulphates and turning locked up phosphorous into phosphates, all of which makes these essential plant building block elements available to the grass plants. Finally for now microbes play a role in priming the plants’ immune system, meaning that they have a wide ranging effect on plant health generally from basic protection through nutrition and assisting in preparedness for attacks by pathogenic organisms such as fungal diseases. I think all of this makes the case pretty strongly for adopting Compost Tea brewing as part of your natural greenkeeping program. So what do you need to get started on your own Compost Tea Program for your green? First thing to say is that time is of the essence with compost tea so it’s essential that you brew your own onsite, so that you can get it on the turf asap. This way you also control the quality; you know exactly what’s gone into your own home brew! A self contained unit that holds the brew and and a pump that oxygenates it during production. A 25 litre brewer is inexpensive and easily makes enough compost tea to treat a bowling green. Yes, believe it or not you’ll need a teabag which you can use to hold your microbe rich compost during the brewing process. Specially formulated compost, with high populations of natural soil fungi and essential bacteria plus protozoa and beneficial nematodes. This includes a comprehensive nutrient pack containing the nutrients required for bacterial and fungal growth plus key nutrients and minerals to provide support for the growing micro-organisms in your compost tea brew. Many lignase producing fungi that degrade thatch do not grow in the time it takes to make a good compost tea. This highly concentrated mix of 7 species of soil fungi is selected for its ability to degrade thatch and organic matter converting it to humus and essential organic acids. The fungi also maintain the fungal dominance needed for perennial grass growth and to help out compete the fungi that cause fairy rings and fungal dry patch. Simply add 100-500 gms per hectare to your compost tea at the beginning of the brewing cycle. You’ll need a good filter to make sure you don’t clog up your sprayer with solids. I’ve worked with one of the leaders in Compost Tea brewing science to come up with a starter pack especially designed for bowling clubs. 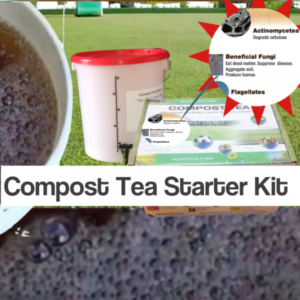 The starter pack contains everything you need to make several brews including a 25 litre tea brewer, a high quality compost and nutrients pack, a compost tea bag, filter and specially formulated fungal additives. iv’e been using compost tea along with aeration program through my supplier on one of my bowling greens for 7 years ,we now have extended play till the end of October due to reduced thatch and excellent drainage ( drainage was a big problem before i introduced compost teas ) ,the green is in very good health now. Is it necessary to buy a new ingredient kit every year or do we draw off liquid then top up to continue the brew, rather like ginger beer plant? Is the pump working 24/7 or is it an occasional circulation perhaps on a timer? The compost tea is brewed fresh for each application using fresh compost, which is pre inoculated with microbes and carbs, so it isn’t stored for any length of time. Once all of the oxygen is used up the tea becomes anaerobic, although you can keep it oxygenated by running the aerator for a while if for any reason you can’t apply it to the green right away. The aerator is running only for the duration of the brewing process, which can vary between 10 and 24 hours depending on type of brew you are making. The tea should ideally be applied within 4 hours of turning off the aerator. Question re Van’s comment on improved drainage. Is this reality? If so could you please explain how this works? I don’t do any work directly with Van, but he has been in touch before to say how well compost tea works for him. It’s not a magic bullet (nothing is) and Van states that it is part of his program. The article is fairly comprehensive as far as explaining what compost tea does, but if you have any specific questions regarding this, please drop a reply here or email me. Found this article very interesting.I apply 1.5 litres of liquid fertlizer a month I have been doing that since last spring ,if I start applying compost tea do I discontinue this practice is there any reason not to use your own garden compost for making the brew?On a completely unrelated topic l am about to buy scarifier blades carbon tipped do I go for 2mm or 3 mm? Compost tea is primarily intended to promote vigorous microbial activity in the soil and although this will, over time, help your turf to make more efficient use of available nutrition it isn’t a replacement for fertiliser. You will probably see a reduction in fertiliser requirements over time though. One further beneficial change you might be able to make on these lines is to change from an inorganic, salt based fertiliser to an organic Bio liquid. Re-using your own compost, there are a few drawbacks, the main one being weed seeds and other contaminants. For example if there is ever any animal manures in your compost it should be tested for E.Coli & Coliform Bacteria as a rule. The pre-packaged product avoids these issues and guarantees the full range of microbes are present. I think the 2mm blades will give you more options for the scarifier. The 3mm blades are probably autumn renovation only tools. Thanks for your reply.my question should have read that I apply 1.5 litres of liquid SEAWEED a month not fertlizer sorry abt that. And I should have remembered that too from our previous correspondence! The liquid seaweed will never be a wasteful addition to what you’re doing and in fact will complement the compost tea very nicely. If there’s a cost issue. you could leave it out if you are using the pre-packed compost, as it comes already inoculated with carbs to get things moving. would i be right to assume that application is subject to enough warmth for the bacteria ? Soil microbes are still active during winter, so it is possible to get started on using compost tea out-with the main growing season. Some interesting research here from Umeå University in Sweden on that very subject. First application of compost tea on last week, aiming for 3 more in the next 3 weeks then down to fortnightly. Is this enough as first time users. Yes, that sounds good. If you follow my Intensive Compost Tea plan you can’t go far wrong. Also you can use compost tea to speed up recovery of stressed and worn areas of the green whenever you want. it doesn’t cost much to brew a batch and it can be very beneficial to turf/soil health. Many thanks for a very interesting article concerning the compost tea. Am I correct in assuming that the starter pack is used in a similar way as making yogurt or sour dough yeast in that some of the starter is kept to activate more material and so is a continuous process? Actually no. Each brew is made fresh, but the compost can be re-used for further brews. Unlike sourdough, which has an endless source of oxygen, the compost tea will quite quickly turn anaerobic as the microbes use up all of the oxygen. However, a brew can be re-fed and re-aerated to keep it viable for a while if the weather doesn’t play ball for application to the turf say. Thanks for your interest and if you have any other questions or comments please add them here or drop me a line on email. The kit has enough material to make up to 12 brews and you can buy any replenishments you need from right here at Bowls Central. Thanks for your interest and if you have any questions just drop me a line. There are no real limits on frequency of application, but I suggest a monthly treatment which means the kit is good for 1 year’s worth of applications. In the next week or so I will be adding details of further products to the members area (if you haven’t done so already you can join here) , including the compost/nutrient kits. As a guide though, with the fungal additive each application will cost around £7 for the average bowling green. Just finished the article of bent grass. Very Scary. A good friend, Pat Christopher from Red Ledges, Utah did his Masters program on this very subject. We all thought it was dead! Scary that it’s being kept so quiet. Any idea how to get involved? Just 100ml will usually be enough for a 25 litre brew. Of course you can also use the compost tea application as a good excuse to get some liquid seaweed onto the green at the same time…add 1.5 litres as a tank mix with the finished compost tea. By using compost tea should we reduce the amount of nitrogen fertiliser, we currently apply liquid feed once each month April through to August. It’s not something you can do right away, but yes the eventual aim of my program is to create a healthy, living green where the soil microbial activity releases Nitrogen from the recycling of organic material created by the plants (thatch). A sward of fine perennial grasses (bent/fescue) thriving in a microbe rich soil will produce around 50kg/Ha of N per year, which is about half of what I recommend for a recovering green, meaning that you can gradually reduce N inputs over time. We have been using compost tea produced from your starter kit since December 2106 as part of an initial two year exercise to monitor its effect on the green. It has been applied monthly as per your instructions and we will require a further years supply. Could you please confirm the costs for the supply of the raw materials which duplicate what was in the original kit so these can be approved by our committee. In addition we have also continued with our normal activities such as verticutting, mowing etc which mirrored your programme suggestions and treated the green to combat the chemical deficiency determined by your free soil analysis. Direct replacement compost and nutrients here and fungal additive here. These are as supplied in the original kit. However, the double sized compost and nutrients is best value here. Reading some posts on another site recently one user was varying the time of brewing so that he was moving from a bacteria dominant to fungi dominant tea. Is there any merit in this? Also can you detect/monitor anything in the tea with a simple microscope? Yes, a strong fungal presence in the compost tea should be the object of the exercise hence the advice to use the Fungal Additive and the 24 hour brewing time. Additionally I recommend 200ml of CMS Shoot (Molasses) as a food source . The double rate Molasses and 24 hour brewing time has been shown to produce the optimum fungal activity. The key to growing fine perennial grass is in the soil biology. 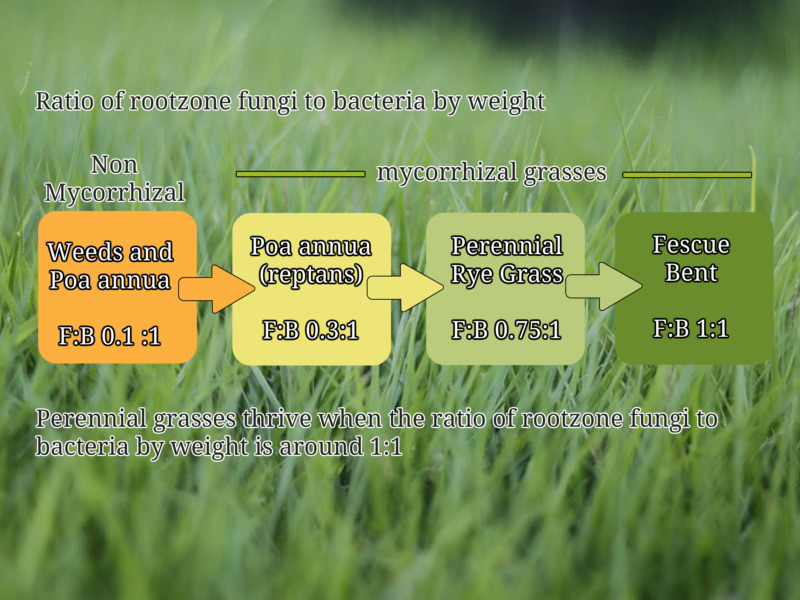 Poa annua thrives in bacteria dominated rootzones, but the fine bents and fescues form symbiotic relationships with mycorrhizal fungi and live best in a balanced fungal/bacterial rootzone. Although you might well be able to observe some of the activity in your tea with a simple microscope, it really calls for a phase contrast instrument, which I can supply if interested.